We are thrilled to announce the official launch of Arlington’s premier coworking space! NuvoDesk won’t officially open its doors until Spring 2019, you can reserve your coworking space now. With the high volume of demand we’ve already seen, we have good reason to believe that NuvoDesk coworking space will be filling up very quickly. To offset that, we’re giving you an opportunity to reserve your coworking space ahead of time. Plus, we’re offering an exclusive package if you decide to lock in your coworking space now! We offer a number of coworking spaces with amenities such as lightning fast wi-fi to power your data and communication needs, on-site storage to keep your valuables safe, printing and copying services, your own physical address, and receptionist services. In addition, we proudly offer an on-site cafe (BFF Café) where you can grab your favorite gluten-free foods, beer, and wine. 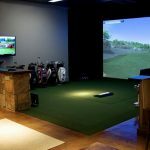 We even offer a world-class Trackman golf simulator where you can come play, and relax. In addition, we offer something extremely exclusive to NuvoDesk – the NuvoDesk Investment Panel, where you can pitch your ideas for possible funding. On top of all this, we offer a streamlined, contemporary design and brand new, comfortable furniture. Enjoy beautiful decor, luxury amenities, and the best in productivity right here at Arlington’s premier coworking space. NuvoDesk will open in Spring 2019, and we believe that our spaces will be filled quickly. For that reason, we’re offering a special package deal for those who want to claim their space ahead of time and save big bucks along the way. This offer is a great deal for any professional, freelancer, or entrepreneur who wants to get a fantastic working space, world-class amenities, and an amazing location. If you want to be close to Arlington’s best things to do, places to eat, and more, then you’ll love NuvoDesk’s central location. When you claim your NuvoDesk space, you are reserving a spot in the heart of Arlington! For a limited time only, we are offering a special 12 month price on our shared desk space. We typically offer our shared desk space at $189 per month. With our exclusive deal going on right now, you can reserve your NuvoDesk shared desk space for a whole year – 12 months – for $999. That’s a savings of $1269. If you’d like to take advantage of this special offer, you can sign up right now by contacting our team today by emailing office@nuvodesk.com.